The official start of Spring is still a few weeks away but I can definitely feel the change in the season, can you? Spring is considered “nature’s new year” and a time we intuitively are called to release what has accumulated over the winter, in both our bodies and our homes. In Ayurveda circles, Spring signals the time for seasonal cleansing. Doing a weeklong cleanse may not be your thing this year but a one-day reset may be more doable and just what you need. Your body is remarkably intelligent and incredibly hard working. Day in and day out, we ask it to process all kinds of things, some nourishing and others less so. According to Ayurveda, your digestive fire (agni) is the key to a strong immune system and good health. Physically, it governs everything from your body’s ability to utilize the nutrients in food to regulating temperature. Agni is also responsible for our ability to communicate, think clearly and experience joy. When your digestive fire is taxed with over consumption of food, information or emotions, not everything you take in is digested and what’s undigested accumulates in the body, as toxins (ama). Ama, is the root of most imbalances we experience. Signs you have ama and may need a digestive reset include, low energy, headaches, weight gain, foggy thinking, sleepiness after you eat, bad breath, a thick coating on your tongue and body aches. The good news is there is something you can do to rid yourself of ama and reset your digestive fire (agni). The practice of cleansing is considered a vital part of an Ayurvedic lifestyle, with great power to improve energy, strength immunity, and reset your overall mental and emotional wellbeing. That’s why I have been doing seasonal cleanses regularly for the past decade. Doing a gentle Ayurvedic cleanse, or digestive reset, will remove toxins, increase your energy, deepen your sleep and improve your mental clarity. Pick a day when you can rest, relax and have very little scheduled. Start the day with warm water with lemon and ginger. Sip plenty of warm water and herbal teas throughout the day. Make at least 24 oz. of CCF tea and sip it throughout the day (not after 2 pm). Follow a mono-diet of kitchari, which is simple and easy to digest. It also is a complete protein source and has a plethora of supportive properties for cleansing. Follow a regular meal schedule. Eat Kitchari for all three meals. Eat breakfast, lunch, and dinner without snacking in between. Be sure to wait at least four hours between each meal to allow the previous meal to properly digest. Make dinner your smallest meal and eat early, finishing at least three hours before bed. Spend time resting, take a walk, do light yoga, breath deeply and take an Epson salt bath in the evening. Reduce screen time and take a break from social media, tv and your devises. Make sure you get plenty of sleep the night before and the night of your reset. 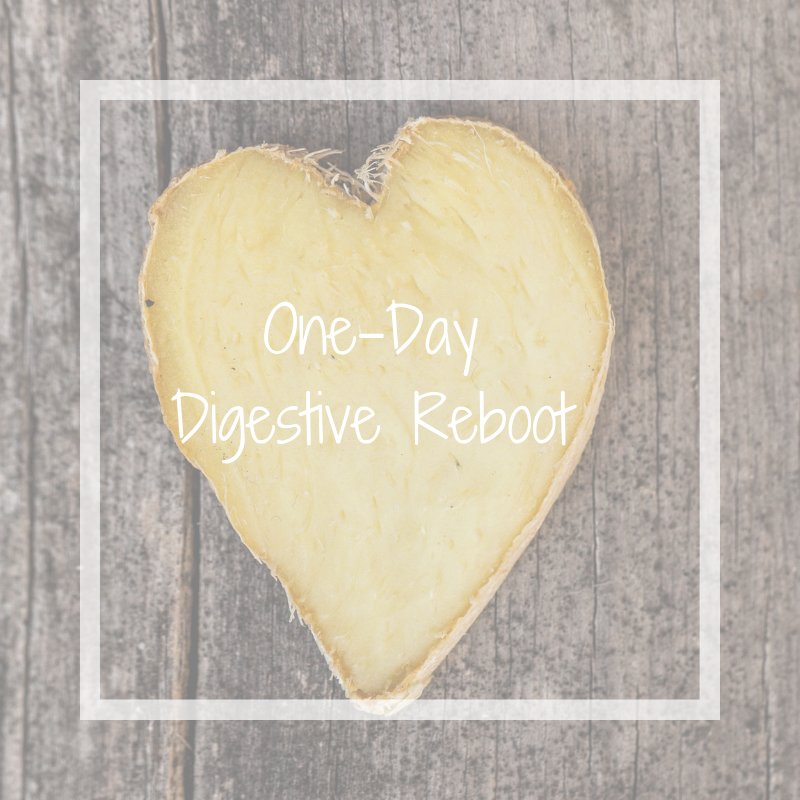 This simple one-day reset can be practiced once a month or seasonally. Tend to your agni regularly for better health on all levels—physical, mental, and emotional.